Portland gave up a five-run lead as they fell to the Bowie Baysox (BAL), 8-7. Miguel Pena struggled for Portland, as he gave up four hits, walked four batters and allowed four runs (three earned) in 5 1/3 innings pitched. Matty Ott fared even worse out of the bullpen. In only one inning of work, Ott would surrender four runs on five hits and a walk to take the loss. On the other side of the ball, the Sea Dogs jumped out to an 7-2 lead after five innings. The Sea Dogs collected 10 hits in the contest, and three starters had multi-hit games. Michael Brenly went 3 for 4 with two doubles, a triple, a run scored and two RBI. Derrik Gibson went 3 for 5 with a double and a run scored, while Jonathan Roof added a 2-for-4 performance with a run scored and an RBI. Blake Swihart added a three-run triple in the top of the fifth. Salem scored one in the ninth to topple the Lynchburg Hillcats (ATL), 7-6. Pat Light struggled through five innings, allowing five runs on eight hits and a walk while striking out three. Light did not factor into the decision. Despite blowing the lead in the eighth, Kyle Martin picked up the win, allowing just one run on four hits through 3 2/3 innings. Dayan Diaz earned his fourth save of the year for getting the final out of the ballgame. The Red Sox collected seven walks on the night, and struck out only five times. Carson Blair went 3 for 4 with a double, a walk, and RBI and a run scored. Aneury Tavarez also put up a three-hit game, including two doubles. Mario Martinez went 2 for 4 with a double, but picked up four RBI along the way. Mike Miller's only hit was a double and Matty Johnson collected one hit in three at-bats but walked twice as well. Despite out-hitting the competition, Greenville fell to the Rome Braves (ATL), 7-4, in game one of a double header. Daniel McGrath took his third loss of the season, giving up six runs on six hits and four walks in 4 1/3 innings pitched. 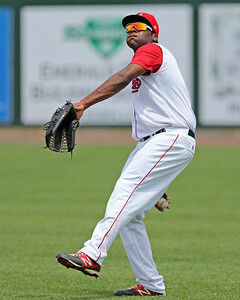 Mario Alcantara also gave up a run on three hits in 1 2/3 innings pitched. Four starters had two hits in this one, though Carlos Asuaje led the way, clubbing two home runs in three at-bats and also drawing a walk. Wendell Rijo and Jimmy Rider put up identical lines, going 2 for 4 with a double and a run scored. Kendrick Perkins (pictured, left) picked up two hits as well. Tzu-Wei Lin and Aneudis Peralta collected the other two hits for Greenville. The Drive took game two, downing the Braves, 5-3, in a make-up of their 6/5 contest. Myles Smith pitched decently, though he struggled finding the zone, allowing three runs on six hits and three walks while only striking out one. Pete Ruiz earned the save, throwing two perfect innings, striking out two along the way. Kendrick Perkins collected another three hits on the day, including a home run. Manuel Margot, Forrestt Allday, and Carlos Coste all went 2 for 4 against the Braves. After hitting two home runs in game one, Carlos Asuaje went 1 for 4 with two strikeouts in game two. The DSL Red Sox managed only three hits as they fell to the DSL Orioles2, 3-1. Jhonathan Diaz pitched well, allowing three runs (two earned) on six hits through five innings, striking out four. Samir El Halaby and Shair Lacrus combined for three scoreless innings out of the bullpen, allowing three hits between them. Rafael Devers continues to hit the baseball, collecting two of the Red Sox' three hits, including a triple. Seven games into the season, Devers' average sits at .481. Roldani Baldwin collected the only other hit. The Red Sox committed two errors behind Diaz, including one by Devers. Player of the Night: Arguments could be made for Devers or Matt Barnes, but Kendrick Perkins' five hits in eight at-bats earn him the honors. Perkins raised his average to .316 on the season. His four home runs in 2014 have already eclipsed his 2013 and 2011 totals, and tie his previous high, set in 2012.